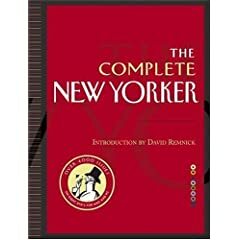 The Complete New Yorker, 4,109 issues and half a million pages of The New Yorker on 8 DVD-ROMs and a 122 page book, ships tomorrow. The New Yorker store sells it for $100, but Amazon has it for $63. I love the tactile heft and feel of printed matter, but I look forward to tossing some old issues I've kept for years. This collection runs from February 1925 to February 2005. If you consider that simply purchasing a paperback of Nobody's Perfect, a collection of some of Anthony Lane's movie reviews, from Amazon.com would cost $11.53, and buying the book and CD compilation The Complete Cartoons of The New Yorker would cost $37.80, then for $13.67 you're buying everything else: all the short stories, articles, photos, ads, and illustrations. And it's searchable (I'm curious to see how usable the search function is). Very cool, though even better would be a way to just search through all this content directly through the Internet. Then I wouldn't have any DVD-ROMs to deal with at all. The New Yorker was probably concerned about bandwidth issues, which will diminish rapidly, and sharing of online accounts, never as much of a problem as content providers anticipate, especially at these prices. We're not talking Lexis-Nexis subscription fees. Also, putting it all online would have put a huge onus on site usability and design, something that doesn't appear to be a New Yorker strength, judging by their online site today. Baby steps, I guess. It's still an exciting achievement, in my opinion. I often think of certain articles that I've read in The New Yorker, and now I'll be able to look them up. How will the search work? Is content organized by decade across the DVD-ROMs, or will I be frustrated by having to constantly pop one DVD out and another one in because content is spread all over the place? Will I be able to copy and paste text and illustrations from the interface, or will it be so securely locked up that it's read-only? The devil is in the details, and the description online doesn't reveal much. I'll post a brief user report after my copy arrives. In somewhat related news, The New York Times launched TimesSelect today. As a home delivery subscriber, I receive access to Op-Eds, which I used to have to pay for, and the ability to save 100 articles every month to an online archive for future perusal. I'll also be able to preview articles online, before they arrive on my doorstep in print form. I can't tell how useful this will be yet. I rarely have time to read the paper the day it arrives, so the article preview function may not be that useful to me. Also, I'd rather have the option of being able to read and save 20 articles a month for free from anywhere in the archive than having to keep up with hundreds of articles each month in order to pick out 100 to save before they disappear into the pay-per-view vault forever.